The Rev. 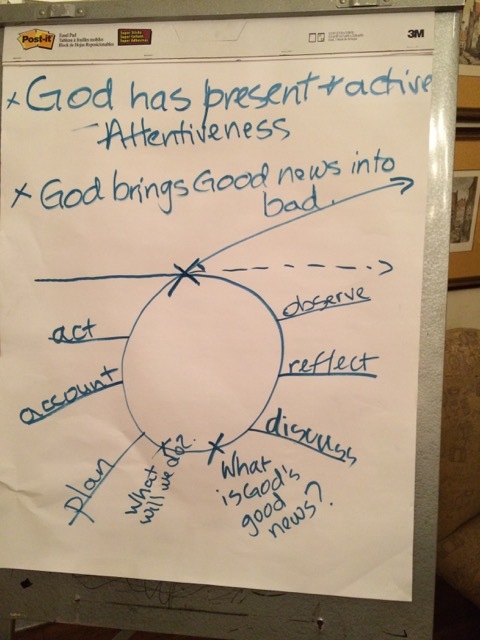 Dr. Kristine Blaess was sharing at our women’s group last Thursday evening from John 15:16, “You did not choose me but I chose you” and she exhorted us to realize that God is always present and active in our life. We need to tune our attentiveness to seeing, hearing, and feeling God around us. He is always working, but we need to be more keenly aware of it. God brings Good news into bad. Kristine was commenting that it has been hard for her to believe that God has already chosen her, before she had drawn her first breath and before she had “earned” His love. In describing herself a few years ago, the voices in her head told her that the only reason God loved her was because she was “useful”. The word was in my head even before she spoke it. I was the one that could plan parties and vacations and took on the hardest projects at work. Never missing a birthday or holiday, I prided myself on how I made other people’s lives easier. Didn’t they have to love me because I was so helpful? And it is just how I treated God too. I tried to organize His world and His churches with efficiency and a hospitable smile. How could God not like such a hard-worker? Kristine continued that we need to recognize the lies in our life and let God bring in His good news. My lie is that I am loved because I am “useful”. The truth is that God loves me because I am His child and His beloved. She provided a useful process to break the cycle of believing the lies. 1. Observe and identify the lie. My lie was that I was only loved if I was “useful”. 2. Reflect on the lie. Where is it coming from? Why do I believe it? 3. Discuss the lie with close, trusted friends and ask for their prayers. 4. Ask, “What is God’s Good news that refutes the lie?” Studying scripture is particularly helpful. 5. Make a plan the next time the lie starts circulating in our head, trying to tie us up into a frenzy. How are we going to refute the lie? 6. Have friends who hold us accountable to not believe the lie and can recognize when the lie is taking hold of our thoughts. When acting out the Good News instead of the lie over and over again, eventually we will become so rooted in the truth that the lie will lose its stronghold over us. I pray that you will act on the Good News, not the lies.